DOLL 2 | Manga Reviews ~ Ramblings of A Fob. It all depends to peoples preferences. I mostly prefer stories that explores the characters relationships and their everyday life circumstances. 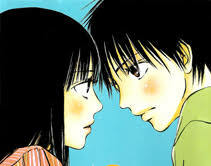 I like character driven series especially Slice of Life genre and I love it even more if romance is meld in it. Then comes adventure/fantasy but with characters I could sympathized to. So there I’ve mentioned it..
Volume 2 of Doll is pretty bland. I felt that most of the stories this time around need more than one chapter to fully feel the impact of the stories. It such a shame that the themes and ideas presented in each chapters could have been amazing but in the end one chapter isn’t sufficient enough. The series is still worth reading as each stories shows different “life lessons” for the lack of a better word. But as I said, most stories feels incomplete, though it does have a conclusion for each stories it just abruptly ends. Not a single stand out this time around. Well the first account was alright about the ventriloquist man. Even for a short time, the character is given a fair amount of development for me to feel his burdens. The subtle happy ending is of course satisfactory. I could have liked the story about the young boy who wanted a new mother as well as the young woman who has cancer if they have only gotten an ample growth. Sometimes short stories has the tendency to come short when it comes to delivering an emotion impact but instead they excel to give out moral lessons which is fine. Still it isn’t as satisfying though..
One thing I find questionable about this volume is that most of the stories explores the negative side of the human nature. I don’t need too much negativity in my series but volume two has plenty of it. The series tries to go deeper exploring the emotional depth of human but fails to even flesh out its characters. Like can’t we have some happy moment where dolls is living harmonously with its master or that these doll owners doesn’t have such miserable life problems? Sigh – why do I ramble when I hate a series lol.. The last chapter is a continuing story from the first volume about the creator of the Dolls designed as close to being a real human. This is actually alright too but then it isn’t anything amazing yet. Some organization is trying to put a stop at the people who is still making these “advanced” humanized Dolls that shouldn’t been created in the first place. It conveys the message that mankind shouldn’t create afrtificial life form as it will devalue the morale of human standard. Meh something like that heck I don’t give a damn about rational/logical intellegence or something along the so called “smart aspect” of sci fi nature or what not. Uggh seriously it makes me feel dumb and foolish. So yeah unfortunately Volume 2 of Doll is a huge disappointment. But hey its a collection of short stories so maybe volume 3 offers a much better set. So here’s hoping..